Fair Play, a rather small event that is newer that had sent me a notecard or two in the past months to see if I was interested in participating. I have been trying to find different things that are a little bit under the radar, maybe a little less stringent in theme, that sort of thing to allow and help for those creative juices to keep flowing. Takes a wee bit of effort to be honest, and a bit of luck to find the right events to be a part of. There’s just so many and it is so easy to feel like you are missing something by not being a part of one. Fair Play like I said is small but has some interesting vendors in it, one is Earthstones. I just adore her jewelry. I can’t help it, along with a few others. I’m not sure how far it will go but I did like how I can add a new item once a month kind of in my own time frame. Rounds begin at the beginning of the month however as long as I put a new item out there… then it’s all good. 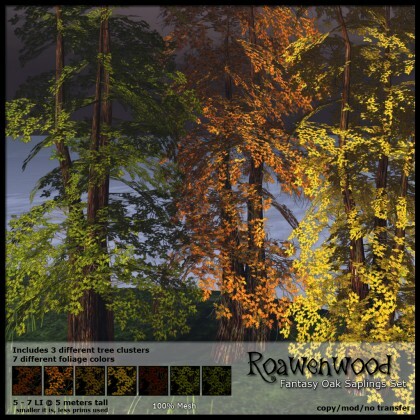 I just joined at the end of this last week so I worked out some trees that I had been toying with after I had done the Weirwood trees for the Conquest event and added them just last night. Available only there until I change the item sometime within the next month… wanna see? I know you do. Set includes three tree clusters and each tree has the option to change the foliage color choosing from 7 different variations. So you’re getting some very versatile trees here. Ohhh!! I almost forgot and if you’ve read this far. At the event I have a couple lil barrels sitting there with a couple trees as a FREE GIFT.